The Wall Street Journal’s Mari Iwata speaks about the future of Japan’s energy industry. The Diplomat’s Tokyo editor Clint Richards sat down with the Wall Street Journal’s correspondent on Japanese energy policies and the Fukushima disaster. Iwata has covered these topics for the Journal for the last eight years, and gave her views on the prospects for Japan’s nuclear sector, renewable energy, and the rebalancing of its energy partners. What are the future prospects for Japan’s big nuclear energy companies? How and where are they most likely to move abroad? There are three nuclear power companies in Japan, Mitsubishi Heavy Industries, Toshiba and Hitachi. At first I think they were hoping to resume maintenance and construction of new plants in Japan, but it’s now very clear that Japan will not build any new nuclear power plants for the foreseeable future, except for those already under construction. Even before the Fukushima accident these companies were looking overseas, because Japan’s population was shrinking and they expected demand to fall. But this came much faster than they thought. Now they have to find new customers overseas, and in this respect they are not actually doing that poorly. Hitachi and Toshiba now both have stakes in U.K. power projects where they will build new plants. Toshiba is also the parent [company] of U.S. nuclear power plant manufacturer Westinghouse, and Hitachi has just recently made another step forward to sell its nuclear reactors to Lithuania. So do you think the nuclear accident in Fukushima in 2011 just accelerated a process that was already happening? Yes, it seems that is the case. When you look at the world you see countries that are concerned about their energy security, and want to diversify their energy sources. These countries are always good customers for nuclear power plant makers. How will Japan manage its increased fossil fuel imports over the long-term? Do you see a change in energy partners, for instance a lot of its energy comes from the Middle East, or will there be a change in the mix of fossil fuels it most depends on? There’s no way to reduce Japan’s heavy dependence on the Middle East for oil, or its current reliance on Australia and Indonesia for coal, because there are no other places that can provide large amounts of crude oil or coal. But after Fukushima, Japan’s nuclear power was mainly replaced by LNG, and LNG producers are a little more diversified than crude oil or coal. When it comes to fossil fuels, Japan will be able to diversify its imports with LNG. So you think the shift will be toward LNG, and that Japan will try to reduce the amount of coal and maybe even oil in the country’s energy mix? Japan always wants to reduce any heavy dependence on any specific country, but I don’t think it can reduce its dependence on the Middle East and crude oil, or its dependence on Australia and Indonesia. What are Japan’s prospects for energy industry innovation? It is already making strides in solar energy and making that a larger part of its energy mix. Are there other renewable sources where Japan could see a significant breakthrough? 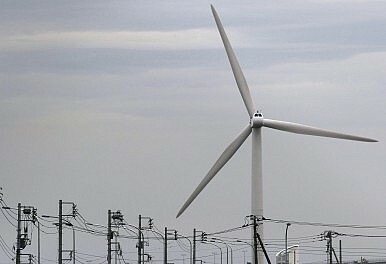 There’s talk of large wind projects off Japan’s east coast near Fukushima. I have not been aware of any major breakthroughs. Concerning the wind power project near Fukushima, it’s quite early and experimental. Japan’s government always wants to promote its manufacturing industry and try to help them to become world leaders, so it is encouraging floating wind power systems. In my understanding no one has been successful in developing floating systems, and so the Japanese government thinks there is a good chance for Japanese companies to develop a leading position. That’s why it is paying to subsidize these things. It spent about 28 billion yen ($261 million) on one project, but in my personal opinion the government is wasting a lot of money on such things, and I’m not sure it’s a good idea to always try to be the world leader. Wind power is a good choice generally speaking, but offshore wind power does not have very good prospects in Japan, because Japan’s coast is not conducive to these types of windmills since the waters are very deep, and so quite different from the North Sea. Also, the rights of Japanese fishermen are very strong, and so you would probably have to pay a lot of money compared to European wind power operators if you want to operate offshore in Japan. Germany, after the 2011 Fukushima accident, closed all of its nuclear reactors and started investing heavily in solar power. Just this summer it was able to increase significantly the amount of solar in its overall energy mix. Does Japan have the ability to do something like that? It depends on how deeply people want to shift away from nuclear power. If you want to do something like that, then people will have to be willing to pay more for energy for some time. If people accept those higher prices, then you can do it. Also, Japan will have to pay huge amounts of money for decommissioning Fukushima. TEPCO has estimated that the cost could be 10 trillion yen, but that’s quite a rough estimate, and it could be double or triple that amount. If TEPCO cannot pay, there is no one besides the government who can. So the situation is quite different from Germany, which just has to pay for high renewable energy costs. But if Japan wants to do the same thing, it has to pay the costs of Fukushima while paying higher power rates. How successful do you think Prime Minister Shinzo Abe will be at bringing more nuclear reactors online? There was a report this week that Japan is now planning to decommission seven reactors. How many (roughly) could Japan expect to restart in the next five years? In the next five years, probably 20, because that many reactors are under inspection by the Nuclear Regulatory Authority right now. It seems that it takes a long time for one reactor to pass their inspection, and so I think it would be very unusual if someone were to expect much more than what have already been submitted to the NRA. Twenty is less than half the total. So you believe nuclear energy is not going to be as significant a source of energy for Japan as it once was? Never. And I don’t think Abe is making an effort – nor is any other lawmaker. It’s probably because when he was campaigning for the general election in late 2012, he thought that public anti-nuclear sentiment would fade over time; but it has not, or at least not right now. People are as anti-nuclear as they were right after Fukushima. Polls always show that about 60 percent of respondents say they do not want to restart any nuclear power plants. So Abe, or any lawmaker, does not want to be remembered as the one who restarted nuclear power after Fukushima. The North American shale oil and gas revolution is gather momentum, and Japan is already partnering in projects with Mexico, the U.S. and Canada. With this new energy source expected to be significantly cheaper than Japan’s current imports, is it possible that Japan could become too dependent on North American energy (or just a single partner), and could this slow attempts to develop alternative energy sources? As I said, Japan is already too dependent on the Middle East in crude oil, and on Australia and Indonesia in coal. When it comes to LNG, Japan is already heavily dependent on Australia, Qatar and Malaysia. So importing LNG from the U.S., Canada and perhaps Mexico would help Japan diversify its energy sources. So there’s no need to worry about dependence on new suppliers, because I don’t think the U.S. can export an unlimited amount of LNG. Canada is a little more costly compared to U.S. projects, so it may not find enough customers to raise funds. By finding new sources and depending more on the U.S. and probably Mexico, Japan will be a little bit more secure. Do you think having these new, cheaper sources of LNG (possibly 20 to 30 percent cheaper than what it imports from the Middle East) will slow efforts to develop not only solar and wind energy, but also other domestic industries like coalbed methane? I don’t think so. Even if North American LNG is cheaper than conventional LNG projects, it’s still very expensive. Also, North American LNG wouldn’t always be cheaper. You always need some kind of benchmark when you decide prices. Japan has used crude oil for a long time. Now it can use the U.S. Henry Hub price, which is a benchmark price for pipeline gas, and is much cheaper than crude oil. Because the U.S. is oversupplied with natural gas, prices should be much lower. So if you can use Henry Hub as a benchmark for your imports, that would be much cheaper than prices linked to crude oil. But what if the Henry Hub price rises? This price is much lower now because of the oversupply, but that will probably be resolved due to imports from Asia. So the Henry Hub prices should be going up. Japan and Russia seem determined at the moment not to let the crisis in Ukraine derail their relations. There is still talk of Russian President Vladimir Putin coming to Japan this fall. Is the resolution of the Kuril Islands/Northern Territories dispute necessary before the two countries can realistically discuss developing major joint oil and gas projects? There’s no need for that. They can cooperate on energy projects without solving the Northern Territories issue. Actually Japanese companies have stakes already in two energy projects on Sakhalin Island, and one of these projects has been exporting LNG to Japan since 2009. These two projects also produce crude oil, which Japan imports, so they can proceed if they think it’s necessary. So the relationship between Russia and Japan can still be developed?